If you could sit down with a woman who has known God for EIGHTY years, wouldn’t you jump at the chance? Well, that’s what we all get to do on today’s podcast. 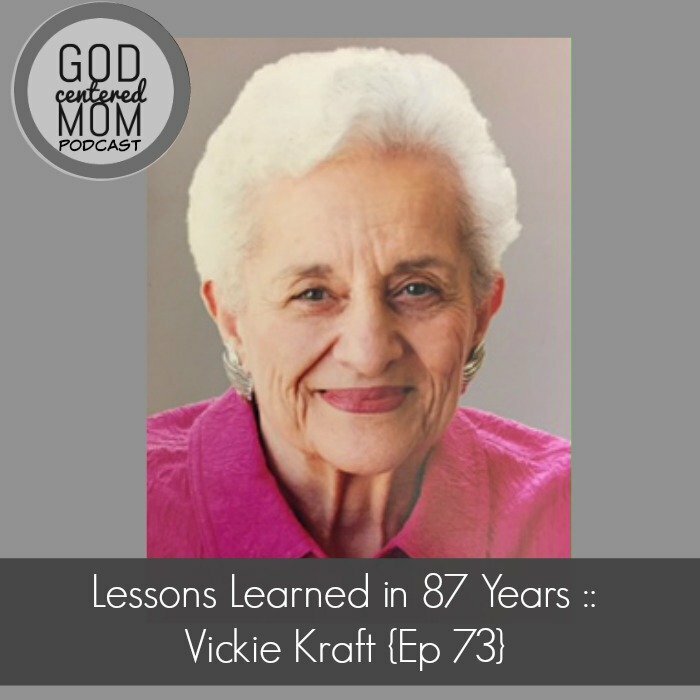 Author & speaker & mentor, Vickie Kraft, invited me into her home and I recorded our conversation. Vickie was the women’s minister at our church for years and has mentored my mentors. She attended seminary. . .in her 50s. . .and started her own Titus 2:4 ministry. Y’all. I didn’t want to stop chatting with her. Every word and Scripture and truth Vickie spoke gave me a little more confidence and courage and peace. I wanted that for you too. So we talked for over an hour and I split our conversation into two parts. My hope is you can really allow her wisdom to sink deeply and hold on. And honestly? I think you and I would benefit from going back and listening more than once. Today we focus on God’s Word, His Faithfulness, our longing for significance, family dynamics, gratitude, and the reality of suffering. Vickie’s tips for being in God’s Word, studying & applying. The necessity of obedience to grow in faith, not to earn salvation. How to get right in the middle of God’s will. Love this podcast! Can’t wait for part 2.
so glad you enjoyed it!! Vickie is just simply the bees knees. Please join us in praying for her health. thanks! Aw, what a sweet lady! I love her. She reminds me of my grandma. Thanks for taking the time to meet with her face to face. She is such a treasure of ideas for women who desire to follow God. Loved this- so much wisdom here! I think we have so much to learn from ladies who have gone before us. Thanks for having her on the show!